Who knew a collaboration of this magnitude was in the works? Read about the brand new single from Jessie J, Ariana Grande and Nicki Minaj out this July. 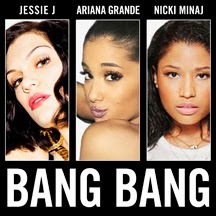 In what is sure to be one the musical events of the year, international superstars Jessie J, Ariana Grande and Nicki Minaj have collaborated for the powerhouse anthem ‘Bang Bang’. The track features production from the iconic Max Martin, Savan Kotecha, and Ilya. Jessie J’s debut album, ‘Who You Are’ [LAVA], marked the debut of a global icon when it reached #1 and was certified multi-platinum in over 15 countries. She has sold over 3 million albums and 20 million singles worldwide to date. The GRAMMY Award-nominated artist was also the 2012 London Olympic Games Ambassador. Her smash ‘Price Tag’ reached #1 in 18 major territories and ‘Who You Are’ also yielded an astonishing six Top 10 singles including the hit ‘Domino’. Among other accolades, Jessie J was the recipient of the 2011 Critics Choice BRIT Award and the BBC’s Sound of 2011 honor. Ariana Grande first landed at the top with her album, ‘Yours Truly’. It debuted at #1 on the Billboard Top 200. The album featured the pop smash ‘The Way’, which went double-platinum and reached #1 on the iTunes Overall Top Songs Chart. 2014 has already been a historic year for Grande. The first single from her sophomore album, ‘Problem’, saw her become the "youngest woman to debut with over 400K sold first-week". It ranked as the 4th "highest digital song debut for a female artist" and 8th highest ever and also went #1 on iTunes in over 65 countries. GRAMMY Award-nominated Nicki Minaj has the highest digital sales for any female hip-hop artist in history. With over 50 million in digital sales as a solo and featured artist, she and Adele are the only two artists to ever sell 1 million copies of five different songs in one year. In 2012, Minaj tied Mariah Carey for most hot 100 entries on Billboard's HOT 100 Chart with a total of 44. Minaj has now surpassed that number with recent hits like ‘Love More’ [featuring Chris Brown] and her latest critically acclaimed single, ‘Pills N Potions’, from her forthcoming album ‘The PinkPrint’, which will be released later this year. Exciting much?! Well listen to the snippet of ‘Bang Bang’ below as well to quench your thirst. ‘Bang Bang’ is out July 29th!